Oskar 125 self-supporting fume extraction arm is made for local air pollution control. Welding smoke, grinding and polishing dust, oil mist as well as many other air borne pollutants can be caught at source with Oskar fume extraction arm. 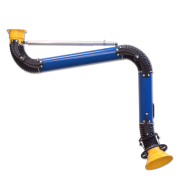 Oskar 125 arm is a unique construction with aluminium outside joints, smooth tubes which allow lowest pressure drop and noise level, easy maintenance and remarkable long operational life time. 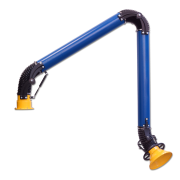 There is nothing with-in Oskar extraction arm except for air flow damper. All adjustments are on the outside so there is no need to stop the exhaust system and there is no contact with polluted air stream nor duct interior when the arm regulation is needed.